Made in Orange County, NC features local products that are affectionately and passionately made right here in the communities of Chapel Hill, Hillsborough and Carrboro, North Carolina. 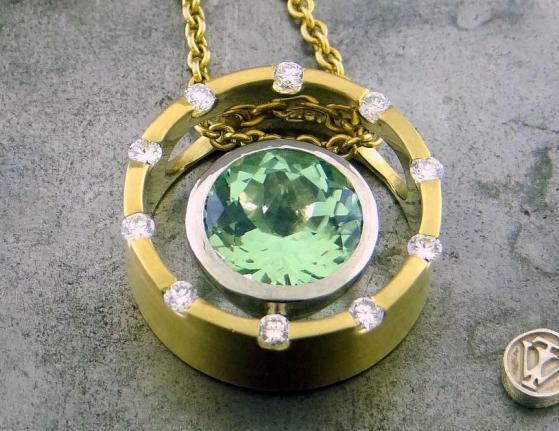 For a list of local proprietors and products, scroll down past More stories. 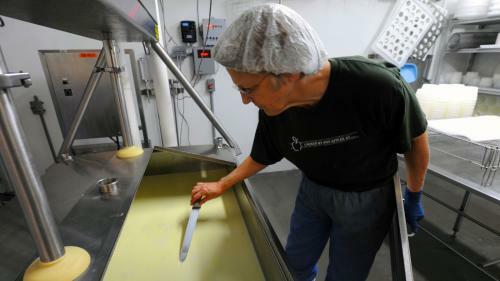 Beginning with just 9 Jersey cows and prime pasture land in Chapel Hill, owners Portia McKnight and Flo Hawley went from 20 years in the food retail business to following their passion for making cheese to now milking 30 cows and producing six award winning cheese varieties. Chapel Hill Creamery cheeses have received top recognition from the NC State Fair International Cheese Competition, the World Jersey Cheese Awards, and the North American Jersey Cheese Awards. 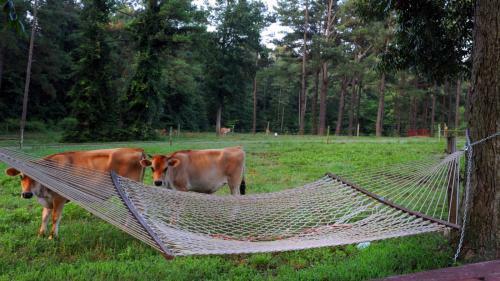 Portia, Flo, and their small-dedicated staff ensure the cows live in a low-stress environment. A mixture of warm and cool season grasses are planted and the herd rotate to different strips of pastures allowing the grass to grow to the most beneficial height for nutrition. Portia and Flo say that each cow has its own personality – and they name each one! As the saying goes, happy cows make more milk and apparently delicious cheese! Calvander, their most robust cheese, is aged for 7 plus months and has buttery and walnut characteristics. A Sonoma coast Pinot Noir will add pristine cherry flavors and a little wild spiciness to this cheese. The 2017 Calvander was just released in October to restaurants. Take a look at some of the recipes local chefs created with this batch. 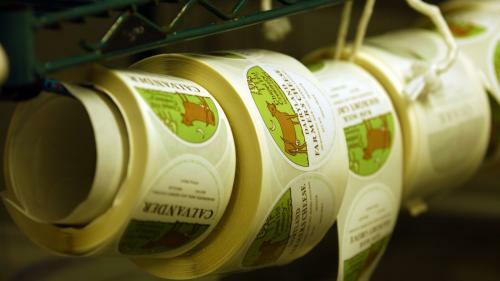 Carolina Moon is a decadent, soft-ripened cheese made from pasteurized Jersey Milk and aged for 4-5 weeks. Its buttery, mushroom-y flavor is best served at room temperature and pairs nicely with a dry rosé or Belgian ale. Hickory Grove has a rich buttery flavor, lacy and smooth texture, and melts beautifully- making the best grilled cheese sandwich. Pair with traditional Chianti or an Oktoberfest beer. Dairyland Farmers Cheese, a semi soft cheese, has a vibrant flavor with a tangy hint of citrus and works well in Mexican cuisine. 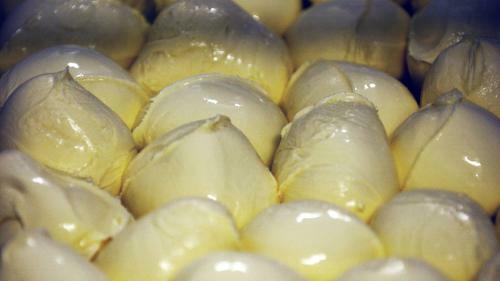 Chapel Hill Creamery makes their Fresh Mozzarella from the pasteurized milk of their Jersey cows and is perfect in a Caprese salad with alternating slices of vine-ripe tomatoes. Pheta is tangy and salty, creamy yet crumbly and is milder than goat cheese- especially tasty with a good quality olive oil, Kalamata olives, and a sprinkling of fresh oregano. Chapel Hill Creamery also makes seven varieties of sausage from their Heritage breed pigs, fed from the farm’s cheese making by-product whey which gives the pork special flavor and texture qualities. It also contributes to their whole-farm sustainability. Find Chapel Hill Creamery cheeses and sausages locally at Carrboro Farmer’s Market, Eno River Farmer’s Market, and Weaver Street Markets and at Whole Foods Markets. They also have home delivery through the Produce Box and CSA through Harland’s Creek Farm. a taste of Orange County! Accidental Baker artisan flatbread crackers using locally milled flour is baked in Hillsborough and sold at area stores. Blakemere Company clotted cream, the taste of England right here in Chapel Hill; their signature item is their Devonshire Delight. Southern Season, Weaver Street Markets and Whole Foods. Bloody Brando Bloody Mary Mix – Locally made in Chapel Hill with a &apos;secret recipe&apos; handed down through generations and proudly mixed at several local bars or for purchase at Southern Season. 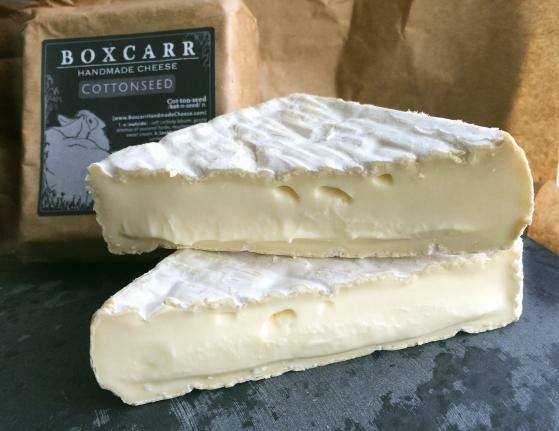 Box Carr Farms Handmade Cheese – Italian inspired cheeses made in Cedar Grove just north of Hillsborough. 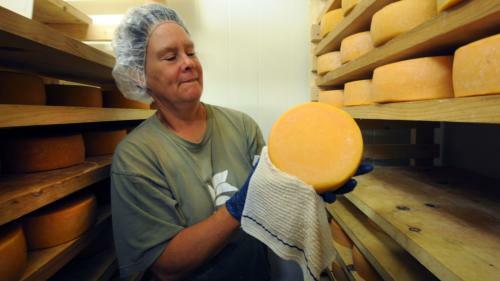 Locally these cheeses can be found at all three Weaver Street Markets, Southern Season and Whole Foods. Busy Bee Apiaries’ Honey – Local sweetness from Chapel Hill. Found at many local stores plus Maple View Farm Store and Hillsborough BBQ. Carrboro Coffee Roasters Coffees – 30 types of coffee both regular and decaf. For a cup of coffee visit the two cafes: Open Eye Café and Caffe Driade, and for the beans visit any local grocery store. FEATURED Chapel Hill Creamery - makes 6 types of cheeses, aged and fresh, as well as 7 varieties of sausage from Heritage breed pigs. Products are available at Carrboro and Eno River Farmer&apos;s Markets, and Weaver Street Market. Chapel Hill Toffee – The gift that is good to give and better to receive! Found at Weaver Street Markets in Carrboro, Chapel Hill and Hillsborough besides many other stores and hotels in Chapel Hill. Chocolatay Confections - Handmade chocolates & confections that cater to those with allergies, offering vegan, peanut free, gluten and soy free products. Chocolatay is located at the new Blue Dogwood Market in Chapel Hill. Cottage Lane Kitchen award winning spicy pepper relish produced in Chapel Hill, buy online or available at Southern Season, Johnny&apos;s Gone Fishing, and Weaver Street Market. Hillsborough Cheese Company – Bloomin’ Sweet Ash Cheese plus others can be found at the Eno River and Chapel Hill Farmers’ Markets and Weaver Street Markets. Just Bee Apiary in Chapel Hill– Citrus Pepper Infused Honey and Short or Tall-Barrel Aged Whiskey Honey that can be found in area stores, restaurants and the Carrboro Farmers’ Market in 2004. Little Red Wagon Granola makes six varieties of granola from natural ingredients. First appearing at the Carrboro Farmers Market in 2004, it is now available in 22 states as well as Canada. Luna Pops makes handcrafted all natural frozen pops in flavors such as their award winning Hibiscus Lemon. Other flavors, seven in all include Cookies & Cream, Rhubarb lime and Sea Salt Caramel, a family favorite! Matthew’s Chocolates – Handmade works of art found in Matthew’s shop on Churton Street downtown Hillsborough. Plowgirl Farm Honey – Honey, vegetables and did we mention honey? Find this sweet treat at the Chapel Hill Farmers’ Market and bee pollen in Dingo Dog craft beer named BEE de Garde! Pluto’s Jamaican Jerk Sauce – BBQ and Jerk sauces, marinades and dry rub seasonings found at Whole Foods, Weaver Street Markets, Harris Teeter and Lowe’s Foods. Sunshine Lavender Farm culinary lavender – this can be found on Etsy through their website or visit the farm during their 2 open houses scheduled for June and December. Sweet Neecy Cake Mix – along with Chocolate, Original and Red Velvet which can be picked up at Whole Foods, Cliff’s Meat Market and Southern Season. Tempeh Girl Tempeh - traditionally crafted, double fermented soy food with a meaty texture and versatility which can be found at Johnny’s in Carrboro and Weaver Street Markets. Tonya’s Cookies – Tonya Council, Mama Dip’s Granddaughter’s crisp gluten-free cookies can be found at her store on Rosemary Street, at Mama Dip’s restaurant or Whole Foods. 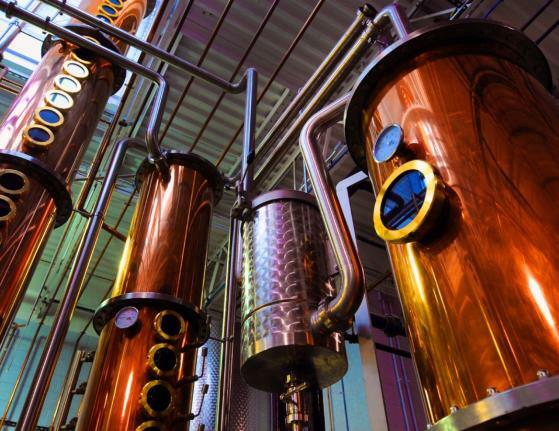 Topo Organic Award-winning Spirits and Age Your Own Whiskey Kits found at the restaurant, tours at Topo Distillery and the local ABC stores. Two Chicks Farm – Homemade sauerkraut and award-winning Kimchi and pickles for sale locally at Weaver Street Markets and the Carrboro and Eno River Farmers’ Markets.